The generous amount of rain brings mosquitoes. Here is some information from Fertilome on how to control and repel mosquitoes. Mosquitoes are probably one of the more common, problematic and identifiable flying insects. Adults feed on sugars from plants or from honeydew from other insects. This is all males feed on, females also feed on blood in order to produce eggs. Most females feed during a certain time of the day, usually during low-light times of the day, although some may feed throughout the day. Eggs hatch and become larvae, also known as “wiggler” or “wriggler” due to the lashing movements of the abdomen. The larvae feed on particles in the water, during this time the larvae will go through 4 molts, towards the end of the 4th molt it will become a pupae. Then they emerge as adults. Adults prefer to hide in protected areas during the day, such as; yards, trees, shrubs, weeds and areas of dense vegetation. The first line of defense would be to reduce weeds and thin vegetation. When applying a control “spray”, apply to lower limbs of trees, shrubs and areas of heavy vegetation, under decks and around the foundation. Make the application in the very early morning or early evening. 38 Plus may be used around the foundation, yard or land-scape this product will go the farthest and last the longest. FL IndoorOutdoor may be used in the house. 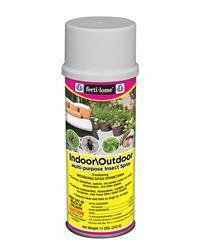 HY Indoor/Outdoor or Lawn, Garden, Pet Spray are both very effective on mosquitoes, LGP may be sprayed on vegetables. These also offer a repelling action. Use Spreader Sticker to increase the coverage on plants and the length of the residue. On a person, Universities recommend a product with DEET, Fertilome does not have such a product. For other outdoor areas, we have Natural Guard Lawn Shield. This is a granule covered with cedar oil. It has a very pleasant odor and is organic so is very safe for kids and pets, no delay in re-entry is required. It starts to repel within minutes of application. It is an irritant to all flying insects and they will leave or stay away as long as the cedar odor is present. Light watering’s or rain can re- invigorate the barrier increasing the longevity, this varies due to the amount of product used or moisture. This entry was posted on Saturday, May 30th, 2015 at 8:24 pm	and is filed under News & Updates. You can follow any responses to this entry through the RSS 2.0 feed. Both comments and pings are currently closed.